E24 Powered Roller Conveyor from Hytrol has become very popular with conveyor users due to its advantages over conventional conveyor and motorized rollers. This quiet, energy-efficient conveyor fits the green mode that many operations are following, and can deliver exceptional flexibility, superb heat dissipation, and a robustness that cannot be achieved with motors embedded in conveyor rollers. 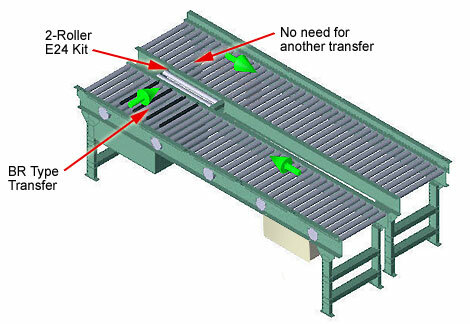 In this application, two E24 parallel lines, a BR Type Transfer and a 2-roller E24 Transition Kit were combined to transfer product from one conveyor to the next. 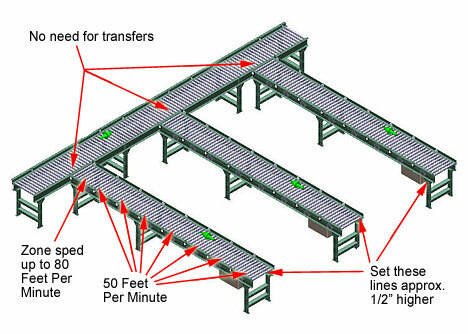 This design eliminated the need and cost of a conveyor-to-conveyor transfer between the two lines. This coupled with the better ROI of the E24 system made this choice of conveyor very easy for the customer to justify. This application transfers loads from lanes of E24EZ, perpendicular to the main line of E24EZ. Normally you’d need 3 transfers to accomplish this, but this design eliminated that cost – and that complexity. Since the speed of the E24 motors is independently adjustable, the load is traveling lane at 50 FPM until it reaches the end zone where the speed is increased to 80 FPM. The 3 perpendicular lanes are set approximately 1/2″ higher than the main line to help make the transition. These are just a couple of the ways that 24-volt conveyor rollers can allow you to do things that aren’t feasible with conventional rollers.